I remember many years ago when I just started practicing yoga, I learned to do yoga poses in a very specific way: feet go here, arms go there, etc. Once I figured that out, I would mostly check out in a yoga class because I could arrange my body parts into the pose that the teacher called out without much thought. I could just cruise through the yoga class on an autopilot and think about other unrelated things (what an unfortunate waste of opportunity!) Then I got introduced to viniyoga and all of the sudden there was no more certainty about how each pose would look – your arms could go up or down, or out, or forward, or up-down-forward-then out in Warrior 1, for example – I was totally out of my comfort zone. At first it was confusing and a bit frustrating, but once I got it, it felt truly liberating. I was no longer confined to the preset form of the posture, but could use it as a tool for my own purposes. I could no longer go on an autopilot either, since I never knew where we would end up with body positioning. But it actually felt much better to actually focus on my body and my practice, rather than have my thoughts wonder all over the place. After practicing this way for almost two decades, I cannot imagine doing yoga without adapting poses left and right, but what is the actual benefit of poses adaptations? One obvious reason for doing it is to accommodate students who have some sort of physical limitations. One student can’t raise her arms up because she has tight shoulders, another one cannot be on his knees because of previous injury, and so on. As yoga teachers, we need to be able to give those students pose options, so that they feel comfortable, supported and included in the yoga class, and get the same benefits as everybody else. This is why we adapt the classical form of posture to make it more accessible to different students. 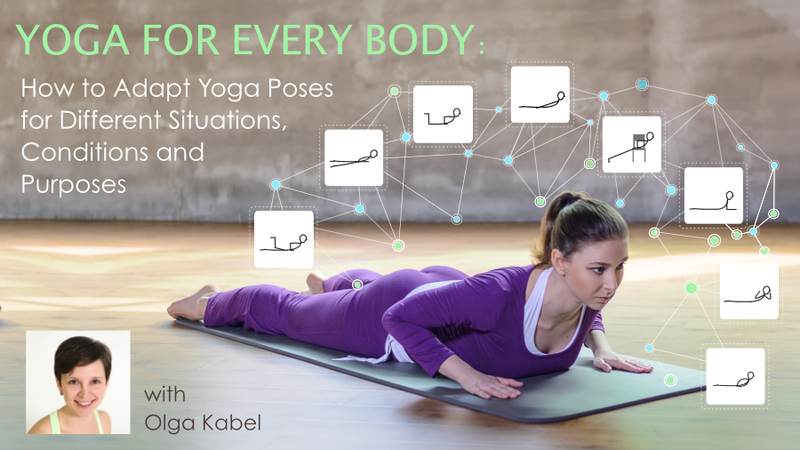 I am very excited to invite you to a two-hour workshop that I will be teaching for Yoga U Online dedicated to pose adaptations. I will show you how to use different versions of poses to make your yoga practice more precise and more effective. You will see how you can use the same pose for a wide variety of purposes, and learn how to choose appropriate adaptations for specific students and specific intentions. Adaptation is the richest and most untapped resource for yoga teachers and students alike – let’s explore them together! You can join me live or listen to the recordings at your convenience. Each session is approximately one hour long. You will get recordings and transcripts of all webinar sessions, as well as the video of 40-minute exploratory yoga practice with me that will show you how to utilize a specific arm sweeping motion in several different poses to relieve tension in the neck and shoulders. You will also have an opportunity to ask questions at the end of each session. Yoga is a great exercise which help our body to improve the blood circulation. It also relaxes our muscles and we feel comfort. Yoga improves our posture and prevent various kinds of pain. Thank you very much for this valuable information.